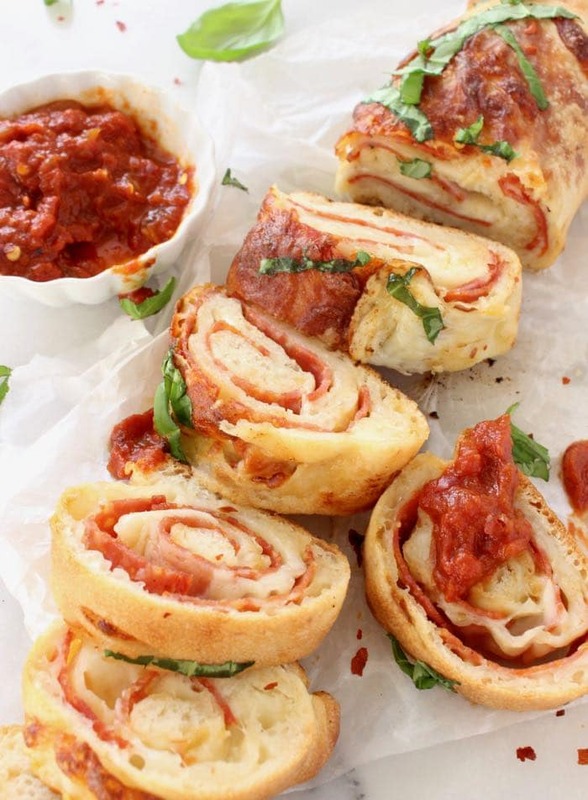 An easy, step by step guide on how two make Italian stromboli from scratch! 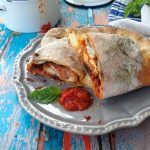 A few days ago we were talking about calzone vs stromboli, but decided to share an easy stromboli recipe guide today to make things easier. Make a batch of this Italian pizza dough recipe. Shape the dough into squares or rectangles. 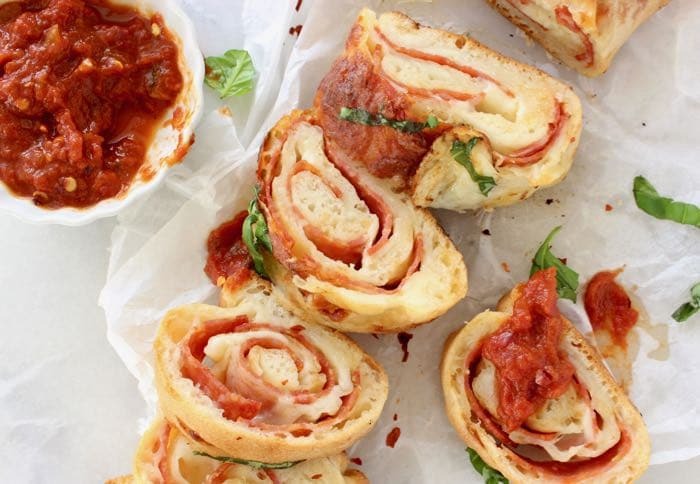 Roll the pizza into a log or you could even shape it into a ring. 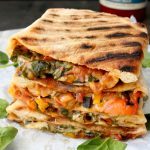 Cut a few slits on top and bake your stromboli on a hot pizza stone, just like you would a pizza. DO NOT put any sauce on the stromboli! This is very important as traditionally the sauce is served on the side on purpose, to keep the stromboli from becoming soggy while baking. You can dip all you want afterwards, but no sauce inside the stromboli. Don’t say I didn’t tell you, okay ?! 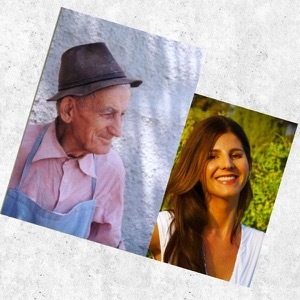 Grazia! To reheat any leftover stromboli just preheat your oven to 400”F with the pizza stone inside. Place the stromboli on a cookie sheet and in the oven for about 15 minutes until you can see the cheese is melting. 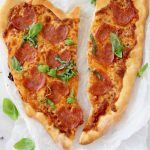 Make the Italian pizza dough according with these instructions. Preheat your oven to 500”F with a pizza stone inside. Sprinkle some flour on your kitchen counter and place one of the dough balls on top. Sprinkle with some more flour and using the palm of your hands press the dough down until flat. Shape it into a square. 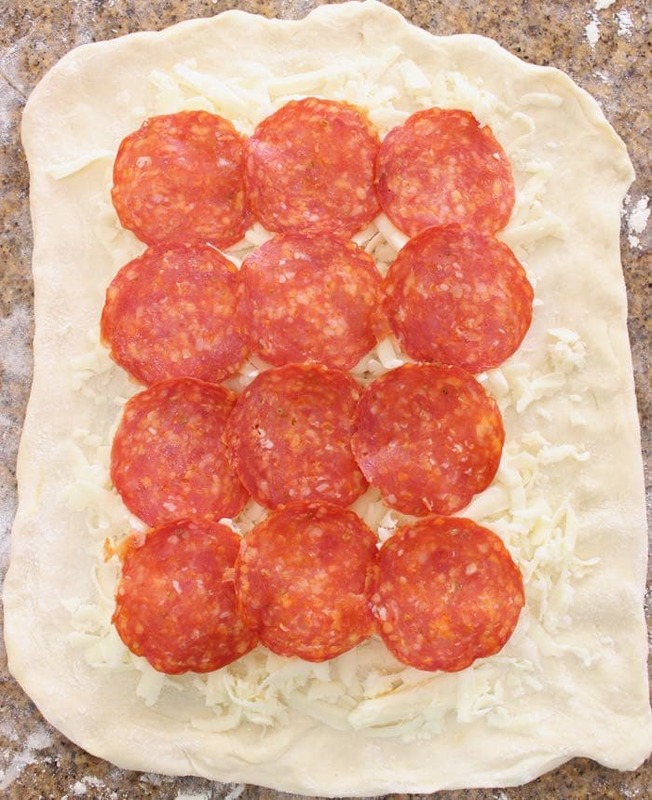 Layer the dough with the pepperoni, salami, ham slices, or your favorite cold cuts slightly overlapping each other. Leave about 1/2 inch border. Sprinkle with the cheese on top and gently fold the dough into a log. Tuck the ends underneath and transfer to a pizza peel or cardboard sprinkled with some flour or semolina. Use a sharp knife and make one inch slits on the top of your log for the steam to escape. 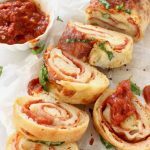 Gently transfer the stromboli to the preheated pizza stone and bake for about 15 to 20 minutes until golden brown on top to your liking. Remove from the oven and allow it to cool off for a few minutes for the cheese to set before slicing it. Garnish with fresh basil and serve with the arrabbiata sauce on the side for dipping.